I alhamdulillah managed to buy New Cultus 2018 VXL Silky Silver for 13.91. Writing down review for people who do not settle for used JDM cars and want to buy a new PKDM car which is cheap and easy to maintain. Exterior of the car is lovely, easy to clean dynamics and cool to the eyes. the only PKDM car with 5 cup/bottle holders. the boot is too spacious and can fit good amount of luggage, fold the seats and you get hell lot of a space. i manually calculated it in the first two tanks refill it came up as 18.9km/l. in city like condiiton is amazing. This car is surely good value for money, in pakistan people complain about quality because they have been spoiled by Japanese domestic market cars thats the sort of quality not sold anywhere in the world other thn japan. Cultus being sold as celerio worldwide offer exactly the same quality and features as its offering in pakistan and wieghs exactly the same as its UK celerio counterpart. the JDM's are being fraudelently being imported as gift to pakistan and damaging the pakistans economy. If you compare Honda City with Cultus 2018 it will not be a fair comparison as this car belongs to a different category and is a hatchback, but still if you do so i put all my money behind cultus as i already own Honda City Aspire 1.5 Prosmatec (2014) and cultus is far superior in comfort and drive if compared with Honda City. i am glad i did not buy an accidental used japanese car and settled for cultus 2018 alhamdulillah. 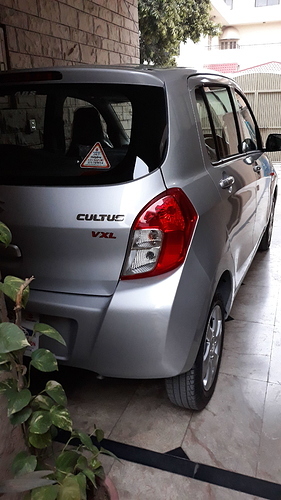 Disclaimer: Above review is coming from a person who has lived significant amount of his life in 4 countries and has traveled around 12-15 countries, have owned numerous vehicles (Civic 2008, Civic 2005, City 2014 Alto 2012 & now Cultus 2018) in Pakistan and have traveled almost everywhere in Pakistan on road other than sindh and Baluchistan so above review is being given having kept in mind the other cars available in Pakistan and what kind of conditions cars face in Pakistan especially in Islamabad. I did not mean or intend to be at all offensive to anyone by the above review. 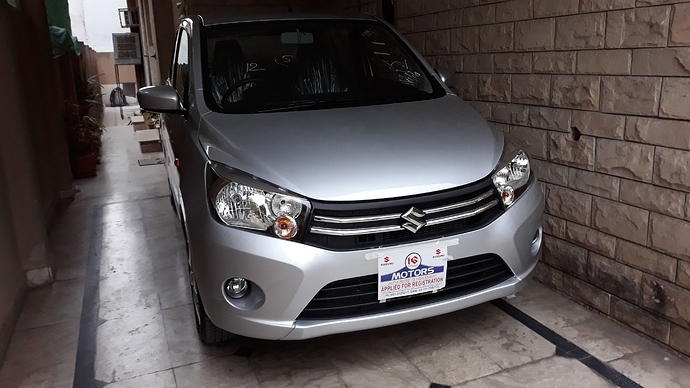 I am the originator of this thread, this thread was made by me to review the New Suzuki Cultus 2018 on principles of honesty and my past experience with other cars. After keeping the car for 9 months, i have sold it. I keep my cars superclean and few pakwheels member already know and would second my way of keeping the cars. The car sold had 13,500km on odo, superclean inside out with no scratches outside or inside the car. I live in urban islamabad so car was literally used in and around F-Sectors of islamabad in these 8 months. never been to any bumpy road or driven by anyone else. With winters approaching in october 2018 i started to hear chu chu sound from the front suspension, ignored it as the sun rose with car being heated from the sun the chu chu vanished and the next morning it returned again. End of october i called the suzuki warranty manager and they happily changed the right and left control arms of the car. The sound remained even after replacement of control arms TWICE (right and left both). With november starting and cold gripping the city the car started to make mroe chu chu sound and developed something new, whenever starting was turned with car idle or moving the steering started to make KR KR KR sounds (WHEN COLD) and when the sun warms the day the sound went away. i got underneath the car and sprayed WD-40 on literally every rubber or bush i could find and got rid of the sound for 2 days and the sound returned back on the third day. With above being taken into account when winter started to approach the interior plastic panels started to make rattling sounds which i diagnosed personally and fixed myself with regular shots of WD-40 BUT with winters getting colder day by day the car was becoming a headache for me. With all the above in mind i raised the car at home and got underneath it and checked all the rubber parts, all the rubber parts are of the worst quality possible which caused them to harden in winters and eventually started showing signs of little cracks. bear in mind you can decrease quality of plastics and get away with it but when you save money on rubber parts upon weather changes they all collapse immediately. Suzuki was happy to replace anything and everything in this car underwarranty as i have already stepped on their tails with my long emails and legal threats. Opinion vary person to person, cultus is true city car. Its gear box and gear shifting is too good to be true. Thought i own prosmatec citt aspire 1.5 which i dont find impressive at all. So you saying that City with 1500cc engine and automatic transmission isn't impressive against manual 1000cc cultus? To me city and cultus both their engine are sluggish and do the job just ok. Specially city as its seriously old engine. As city is a layman car i pak it should offer supreme burning efficiency and good mileage which it fails todo so if compared with cultus. Well i got it for 13.61 with 30k discount thru some of my resources in suzuki. Invoice price though is 13.91. With Filer tax is 15k and another 15k registration cost. To me in total it costed 13.76 On Road price. So it would cost 14.06 ON ROAD PRICE (bearing the fact that filer tax gets adjusted or refunded) in total in normal circumstances. The VXL variant is readily available and VXR in 15-20 days time. Please do not post something which you dont know. We as a qaum like to comment without knowing any facts or figures. I have posted complete breakdown above. Dear does it show outside temperature in meter cluster? no it does not, the UK variant of celerio does but the PKDM variant does not show outside temp or i might not have switched it on. from meter cluster you can control clock, security features of the car, indicator flashers, Doors lock and unlock response segments & quite a few other things, i have not been able to go thru multi info display of the meter cluster properly. Check settings because AGS variant have this feature. yes you are right, i just got it checked. the Auto variant comes with outside temprature but manual does not worldwide so paksuzuki is not giving it in manual either. May be... I'm planning to buy one.but you thing AGS variant worth 15.28? Aqua is available used and probably in or around 1.7-1.9 million bracket. also it will probably be/will be imported fraudulently in gift scheme which hurts Pakistans economy very badly. also city is horribly uncomfortable. In modern world its not the amount of metal you get in same money. i.e (CITY you referred). i think for 15.28 its too expensive, 13.91 is the max one could pay for cultus but for that much money it comes in manual. I have city aspire 1.5 manual 2015 so no more city..
Actually my wife wants to drive and she can't drive manual.